Location: Whale Beach, northern beachside suburb of Sydney, New South Wales, Australia. 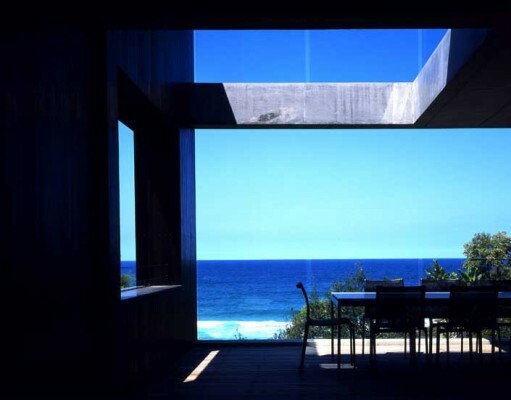 Whale Beach House is located 40 km north of central Sydney, NSW. Architecture and physical location have always been inseparable from one another. The location, its characteristics and its history are part of the emotive connections that form a sense of place and context. This project articulates the idea of a modernist approach to the peninsula’s traditional concept of a beachside dwelling. The site is located at the southern end of Whale Beach, between the main road and the beach. Facing due east, the site falls away approximately 7 metres from the road to the eastern boundary and is flanked on both sides by brick- and-tile residences of a larger scale. An early idea was of a timber packing case fallen from a ship and washed to shore. Further images of a wooden crate lying in the sand kept the idea principle in place. From the street, the visual image is of a black box with blinkers either side to accommodate entry and stairs. The box provides the living space, while the protective sweep of the enveloping timber arms provides light, air circulation, ventilation and provides view corridors to the beach from the road, maintaining public amenity. Solar gain was achieved by creating voids between the outer enveloping walls and the inner ‘box’, which forms the central core of the building, allowing light penetration from the north through the open void on one side, and from the west through the double-layered white glass roof to the opposite side. 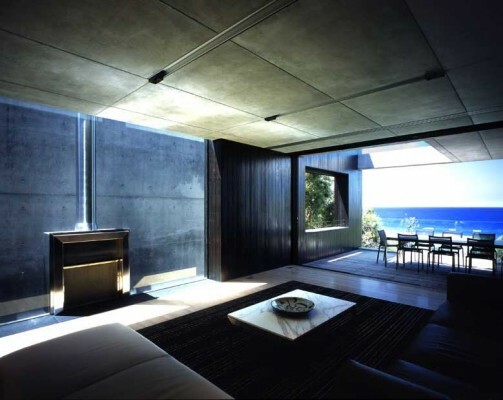 On entering the building, the visitor faces a large glass window with views through to the beach, flanked by a three storey high raw concrete wall. The entry level floor comprises living, dining, and kitchen areas. The southern corridor well provides cross flow ventilation, stair connections, and internal natural calming light from the ceiling. 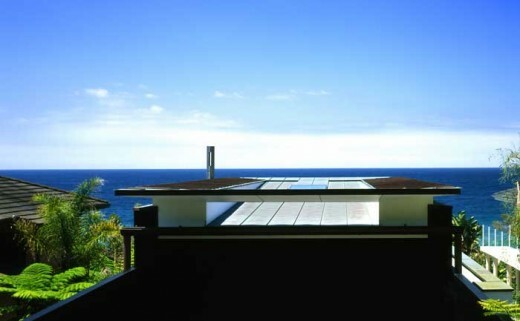 The terrace of the main bedroom, which is on the top floor, is punctured to allow light to penetrate to the deck below. Although the building rises three storeys, the dramatic cantilever of the top two floors allows the mass of the building to appear to hover above the ground. This in turn provides shade for the pool and entertaining area on the ground floor. 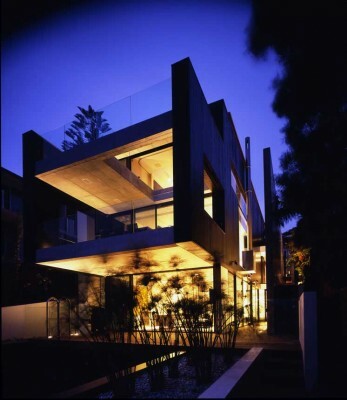 The entire massing is clad in black recycled timber and forms a U shaped black structure to the street with a floating that allows views to the horizon. Major contributions to the design were made by the structural engineers, landscape architects and an interior designer. The demands placed on the engineer were considerable with respect to stabilizing the site along the boundaries. The landscape was sensitively designed to compliment the materiality of the building. The majority of the street frontage is planted sensitively with natives, fed by two 4000 litre stormwater tanks. The co-operation of the interior designer and his prior knowledge of the clients assisted greatly in the development of an interior language compatible with the architecture.